*Students listed on this page include those on whose for whom Boyer serves as principle advisor and those for whom he is a dissertation committee member. Gabe is interested in the phylogenetic and adaptive context of euarchontan origins. He is working to better document the morphological affinities of basal and enigmatic fossil euarchontans as well as proximal outgroups to the euarchonta including both extant and extinct species. Gabe is also working to document the changes in Paleocene-Eocene faunal community characteristics in order to better understand the biotic and abiotic factors affecting early evolution of North American members of the Euarchonta. Methodologically, he has begun to develop more efficient means of scanning articulated museum specimens of extant taxa to extract rarely available comparative osteological data. He is also improving techniques for quickly and accurately segmenting individual bones from such scans. Justin is interested in the diversity of modern platyrrhines and the evolutionary history of this clade with a focus on postcranial morphology. In his research he utilizes 3D scanning technology and geometric morphometric statistics to represent and analyze geometrically complex postcrania, such as the bones of the elbow or tarsus. With this approach he hopes to improve quantitative documentation of phenetic linkages among bones of different platyrrhine taxa as a basis for addressing questions relating to the phylogeny and function of this diverse radiation. Julia is interested in tooth form and function. She is also interested in the development of comparative methods that focus on "homology-free" shape properties (e.g., Bunn et al. 2011). For her dissertation she will test effects of combining digital datasets creating using different scanning modalities by different labs in comparative morphological analyses to help establish more reliable production protocols and more pragmatic quality standards for digital data. Additionally she will create more user friendly computer software interfaces for analysis of digital data. Finally, she will expand the taxonomic sample of extant and extinct animals that have been analyzed with dental topographic variables, putting an emphasis on anthropoids and cercopithecoids. Stephanie is interested in early primate evolution and origins. 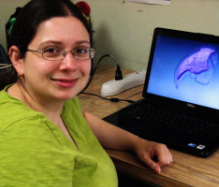 Using a variety of methods, her dissertation research explores the functional and phylogenetic significance of distal phalanx diversity in fossil groups such as adapiforms and omomyoids. This work particularly focuses on the origins of primate nails and grooming claws and what they can reveal about the emergence and relationships of major lineages. Recently, she has quantitatively documented the presence of grooming claws in some living platyrrhines (Maiolino et al. 2011) and in the fossil adapiform, Notharctus. Her ongoing work intends to shed light on the polarities and origins of this enigmatic feature among different primate groups.